By the way, I did not trust the [James White Library at Andrews University] to mail the photos to me, I personally stood at the counter, looked through the files and requested they make copies of the pertinent photographs on their copy machine. I did not "doctor" any of the photographs (period, exclamation point, et cetera -- it's the SDAs who "doctor" their photos! ).—"Re: Jewelry and EGW," August 27, 2005, bold added. You will see in some of of the photos published in White-Washed an inhancement [sic.] of the image (i.e. increasing/decreasing the contrast or exposure) in order to make a particular portion of the photo subject more visible. For example, the original photo shown on page 203 of White-Washed clearly showed the silver/gold chain on EGW's chest -- but the screening process used to reproduce that picture required increasing the contrast to make the jewelry more visible (as you know, 2d and 3rd generation photo copies tend to block up and obscure details . . .).—Ibid., bold added. As we have shown by comparing Sidney's picture with the original, he apparently purposely adjusted the contrast of a little portion of the picture, a portion in the shape of a chain, just where he wanted a gold chain to appear. He did not adjust the contrast of the entire picture equally. That's even more apparent when one compares the picture his book now uses with Dirk's old copy of what his book used to use. Unfortunately, when Sidney thus selectively adjusted the contrast, he ended up drawing the chain on a part of Ellen White's dress where it wasn't supposed to be. Thus we are left with an odd situation: Sidney admits that he did doctor the picture, but at the same time he assures us that he did no such thing.
. . . (which didn't show the chain) was one of the photos that the [Review and Herald Publishing Association] retouched and subsequently published.—Ibid. Of course that can't possibly be true. What we call the original is the photgraph available through the White Estate's web site, a photgraph that appears to never have been printed. And we also have called the original the one that appears in Spirit of Prophecy Treasure Chest, the very picture the current edition of Sidney's book "plagiarizes." And both these examples of the original clearly show that Ellen White was wearing a pocket watch attached to a chain made of gold, silver, brass, leather, or hemp. 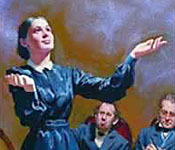 Ellen White was wearing a pocket watch. She never condemned the wearing of pocket watches as contrary to the Bible's counsel against jewelry. Sidney and Dirk mistakenly used a picture in their accusation in which Sidney had purposely drawn the chain on the dress by selectively adjusting the contrast.